Redesign projects are always interesting because usually you are working with existing data and trying to put a fresh face on it. I find it best to do a little investigating even if the client is happy with the existing content. For instance, which pages are getting the most attention? How effective are the conversion pages? How effective are the calls-to-action? If there is a shopping cart in place, where are people aborting the process? All these things need to be looked it. In a way, it’s better than starting from scratch because you do have a chance to fix what’s not working and improve upon those areas that are. However, redesigns are not just design projects, they are also a redo of the way you are presenting yourself marketing-wise, content-wise and design-wise, and usually come with a technical upgrade. Design – on the surface the site is very nice and may win lovely design awards, but will it really get you more business? SEO – you sure make google happy, but does it actually interest the visitor or are you bombarding them with keywords? And have you completely compromised the design? 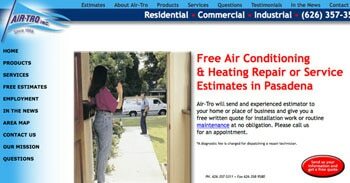 After the initial consultation, airtro.com was given a thorough site evaluation in terms of design, structure, usability, traffic, marketing messages, and search engine optimization. 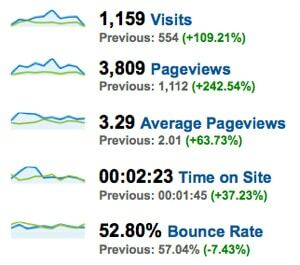 Fortunately it had google analytics installed on the site so a lot of information was available to make conclusions. 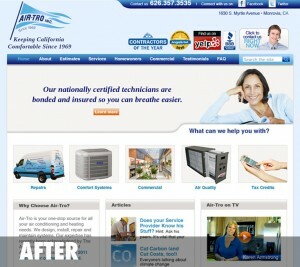 The biggest problem with Air-Tro’s site was that the design was too dispersed and there were no clear calls-to-action. As a visitor it was hard to determine where to go or what to do. The challenge was to use the existing content but reformat it into a clean and inviting web presence that would be intuitive for the visitor, thereby enabling the site to more effectively convert visitors into leads for the company. My approach was to completely redesign the site. I revamped the marketing messages and re-organized the navigation structure to make it more intuitive, and I integrated it with the WordPress content-management system so the company blog would appear right on the site rather than externally. On this project I did all the design, marketing messages, content restructuring, and project management myself. The only outside resources I used were a coder to build the WordPress framework and an SEO specialist to handle optimization. 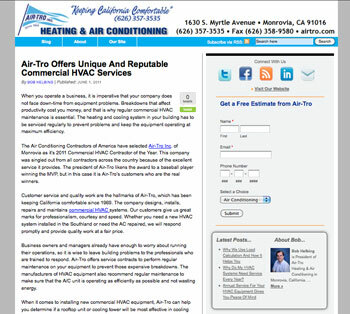 Air-Tro Inc. is a $7 million-a-year air-conditioning and heating contractor serving greater Los Angeles. They provide a full range of air conditioning, heating, and ventilation services. The president, Robert Helbing, was working with a business consultant who had encouraged him to have his web site redesigned. Mr. Helbing was pretty happy with his web site content, but he wanted a new look that was clean, intuitive, informative, and welcoming. The users he wanted to attract were homeowners looking for someone they could trust to work in their homes, and businesses searching for a reliable, inexpensive service provider. A busy, visually distracting home page with a high bounce rate; that is, people would see the page and leave, never to return. The most important “buttons” were not clear. There was no clear call-to-action, and no easy way to distinguish the relative importance of the various links and pieces of information. The most valuable space on the site, the upper left corner of the page, is taken up by the words “To Review Account Information.” This area is only for customers, and when I reviewed it I found that it was not working. The site contains a lot of good content and useful information, but the poor navigation and unclear buttons made it hard to find. At the bottom of the home page was an excellent video, but the thumbnail image didn’t call any attention to itself, and the video’s poor placement made it a big secret. Dated images and graphics made the site look really old and poorly maintained. The titles of sections throughout the site were focused on Pasadena for SEO purposes. Not only did this limit the searches (bringing only 1,000 searches per month), the wording was made awkward by the excessive repetition of the wordPasadena. An external blog existed, but because it was not attached to the site no one knew about it or had access to it. Most of the traffic was direct traffic (pre-existing customers or referrals) Only 32% was organic search traffic. Whereas it is good to have returning customers, there are 11,000 searches for air conditioning, heating and HVAC in the Los Angeles area every month, and none of them were bringing visitors to this site. I made the overall design more user friendly by simplifying the navigation, and I reorganized the content to direct visitors’ attention to where we needed it to be. Key elements on the home page and some internal pages were re-worded to create clear calls-to-action. The updated look was intended to help the visitor get the information he needed to make a decision and prompt him into action. I prominently placed Air-Tro’s awards right at the top of the page in order to emphasize their credibility to potential customers. A visual slider was put at the top to address customers’ key concerns: reliability, expertise, the company’s stability, etc. Big buttons were used for the most popular selections and to help guide visitors towards their area of interest: Repairs, Systems, Commercial, etc. 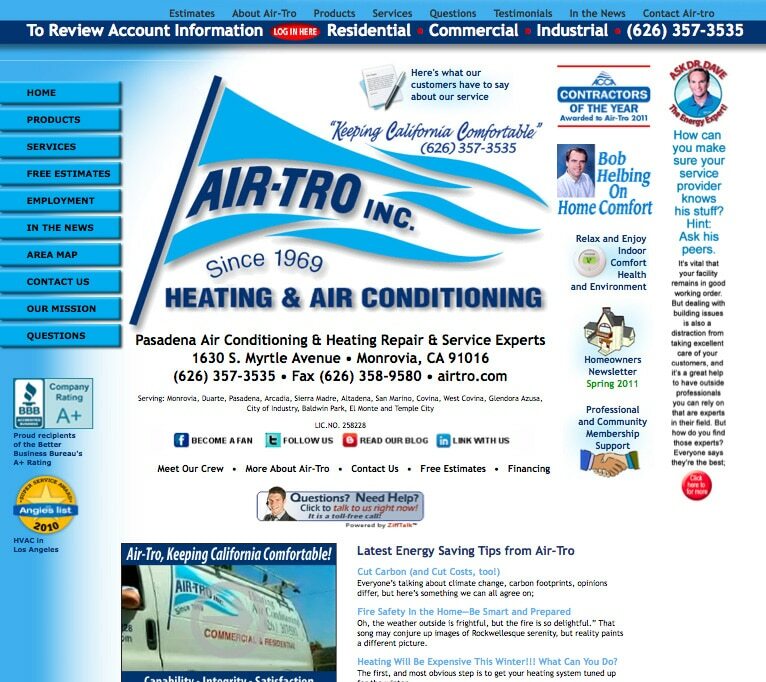 “Why Choose Air-Tro” was put right on the home page to orient the visitor immediately. A nice thumbnail image from the video was featured. Links to recent articles were put on the home page. A blog was added to the web site, enabling the client to add content and help with search-engine ranking. Blog posts were paired with images to make them more visually stimulating and draw the reader in. 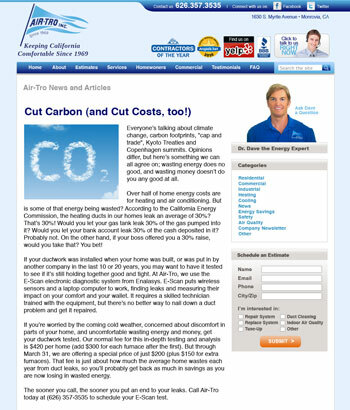 Although Dave—the energy expert—isn’t writing all the blog posts, I put his image there to emphasize that he is the expert. 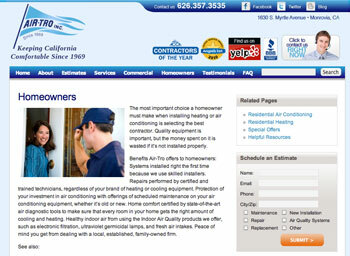 Air-Tro wanted visitors to get estimates, so an estimates widget was created and placed on every page. Dated photos were exchanged for more modern stock photos and some great project photos supplied by the client. Using WordPress for this site made it easy for the client to add new articles, blog posts, and testimonials. The site was also set up for seamless integration with social media. Blogs are constantly crawled for changes, so this added to the SEO. Transferring the 50+ pages of content took a lot longer than anticipated because all the pages with products had to be reformatted. I ran into code and style-sheet conflicts and ultimately found it easier just to strip it down and recode all those pages. 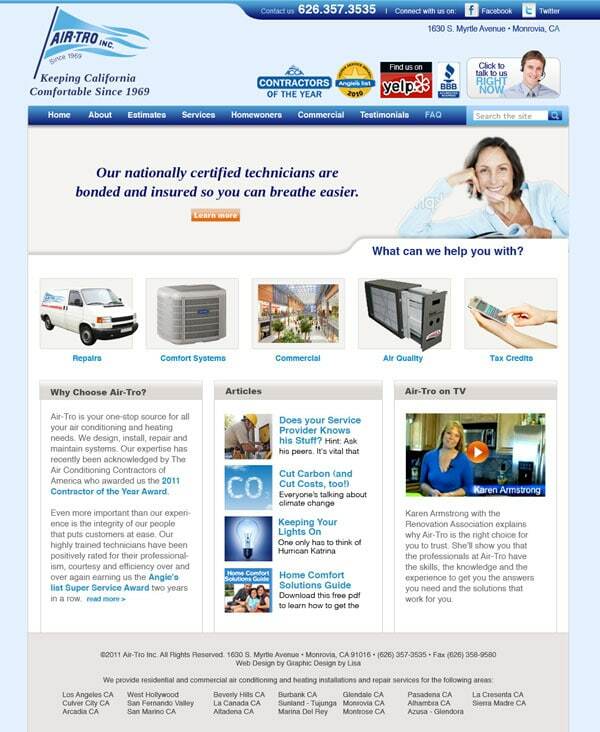 The new web site focused on search-engine optimization for the greater Los Angeles area instead of just Pasadena, and all the images in the new design were optimized to this end. 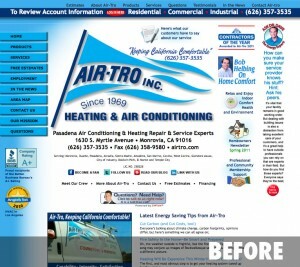 The outcome of the redesign of airtro.com was an increase in traffic to the site. The blue line shows the traffic for two months after the site’s relaunch, and the green line shows the traffic for the two months before the relaunch. These numbers reflect only traffic from search engines, not direct traffic (people typing in the URL) or referral traffic (from ads). There were twice as many visitors after the relaunch. A lot of this was due to the SEO work, but you can see from the breakdown that visitors were spending more time on the site and viewing more pages—they weren’t bouncing as much! Those statistics are directly related to the redesign. 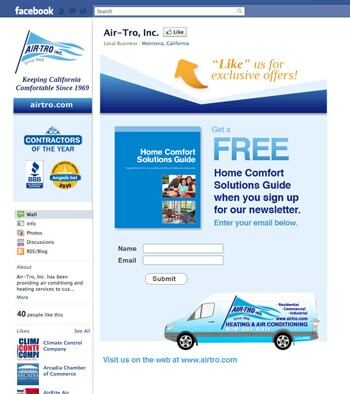 I also created custom Facebook, Youtube, and Twitter pages for Air-Tro to complement the new web site. After I optimized the page by creating and adding custom graphics, Air-Tro’s Facebook fan count went from 40 to 60 in three days without any advertising. The one area of the web site that could have been done better was the testimonials. It was a challenge because there were almost 200 testimonials categorized by location, service technician, and whether the customer was residential or commercial. Pages were created for each of these categories, but as new ones are submitted they need to be entered separately for each category. The quantity of testimonials also affects the search results for the site. I am working with the client now to come up with a better solution for these pages. The client and I now plan to review the site periodically for conversion rates by doing A/B testing on the most accessed pages. We hope to do this every six months or so in addition to the monthly SEO work. We also have a maintenance plan so that we can monitor the WordPress plugins, do any necessary edits, and create new pages and special offers. I would love to hear about your experiences with redesign projects and what challenges you may have run into. Please post your comments below. For further information about redesigns, social media customization and marketing services, contact Lisa Miller.